You can enter an account note into a patient's record as needed. On a patient's Overview page, the Ledger box displays the patient's balance, the name of his or her primary guarantor, and an account note icon. If the icon is gray , there is no note for the account (a blue icon indicates that there is already a note). Click (or tap) the icon to add a note. On a patient's Ledger page, the name of the patient's primary guarantor and an account note icon appear. If the icon is gray , there is no note for the account (a blue icon indicates that there is already a note). Click (or tap) the icon to add a note. Insert the current date, and then type the text of the note. 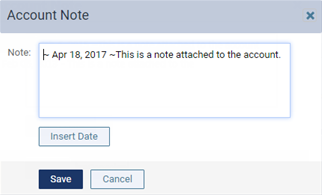 The account note icon is now blue , indicating that there is a note associated with this patient's account. You can also access and change the note as needed from this patient's record, the patient record of this patient's primary guarantor, or the patient record of any patient who has the same primary guarantor as this patient. Is there away to Not be able to complete a patient until Notes are written? We are seeing where there are some notes are not being saved or written at time of the appointment and this would be a good feature to have implemented to save this from happening. Sorry, there is not. But I added your request to the "Feature Request" forum. Click here to view.